Pets, just like children, can get very stressed during a move. So it’s important to do what you can to keep them calm and happy during this chaotic time. 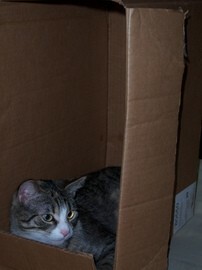 And, with a little preparation ahead of time, your pet can be comfortable for your upcoming move. #1 – Take at least one month to pack. This will help your pet get used to the idea that change is coming — without that change being too drastic for it to handle. Dogs and cats can become especially agitated if their routine is changed too much, so it’s important to do what you can to alleviate the feeling that things are changing too fast. #2 – Make a trip to the veterinarian. Most states and countries require that you have a clean bill of health from your pet’s veterinarian before being allowed to enter said state or country. You’ll want to have something showing your pet’s shots are up-to-date and that your pet is healthy. #3 – Get new tags made for your dog. New dog tags should have your dog’s name, your name, your new address and new phone number. This will ensure that if your pet runs off, it can be returned to you easily. Also, this is good if your pet is going to be traveling by plane; occasionally airlines will place a pet on the wrong connecting flight, so having the tags to help identify them makes it possible to get your pet back to you quickly. #4 – If you have a cat get a cat leash. Cats sometimes run off after you first move. Having your cat on a leash for a month or so while you show it the new neighborhood is a good way to help prevent this from happening. Dogs are more adaptable, so there is a bit less chance of this happening with a dog. #5 – If your dog will be traveling by air, take your dog for a long walk prior to boarding the plane. 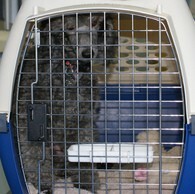 Also be sure and not give your dog any water for 3 hours before the flight to help prevent in-flight accidents. You can always put a small litter box in your cat’s carrier so there is less concern with a cat for this. 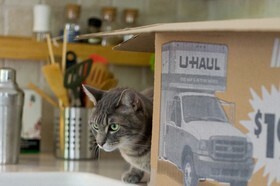 #6 – Keep your pet’s routines the same right up to and during the move. Just like kids, animals don’t take well to a lot of change that happens all at once. They can even become sick if they get overstressed, so keeping their routines the same will help with this. 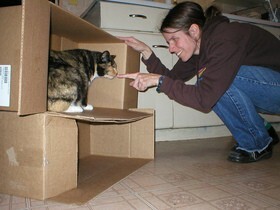 #7 – The day before the move, designate one room in the house “the pet room“. Put a big sign on the door saying, “Pet Room: Do Not Open” so that movers, friends and family will see it and won’t accidentally let your pet out. In the room, put the carrier they will be traveling in, food and water, as well as blankets, pillows and your pet’s favorite toys. This will allow your pet to get used to the carrier they’ll be traveling in, and also help them to not get scared with all the activity of movers, friends and family packing things and moving furniture. 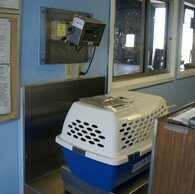 #8 – With smaller pets, make sure their cages are covered during travel. This is important because small pets such as guinea pigs, gerbils and birds tend to become more easily stressed and excited than larger pets. Keeping their cages covered will help to keep them calm. #9 – If you notice that your pet is becoming overstressed, take it to the vet. Some animals have been known to die if they become too stressed, so it’s better to be safe than sorry with your animals. The important thing to remember with your pets during moving time is to minimize the amount of changes they are being exposed to. The same is true after the move as well; you want to expose them to small amounts of change at a time. That way, they will become used to their new home and be happier for it. Did you know there are even pet moving services to assist you in physically moving your pet from one location to the next? Pet movers are most commonly used for long-distance and overseas moves, as well as times you are unable to take your pet in the car with you. It is recommended that you investigate a company thoroughly before entrusting them with the care of your beloved pet.